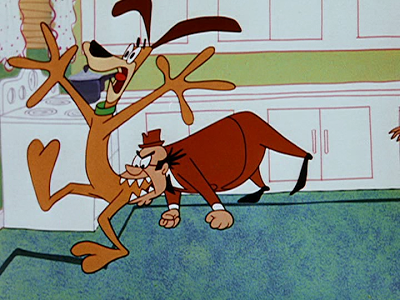 ‘Crazy Mixed-up Pup’ was the second of four cartoon Tex Avery directed at the Walter Lantz studio. Unfortunately, it is not one of his best. When a man and his dog are overrun by a car, mixed-up blood plasma results in mixing their behavior: the man starts to act dog-like, while the dog wins some human character traits. This is not a very exciting idea to start with, and Avery milks this premise to a nice finale, without ever getting really funny. Luckily, he would do much, much better with his next cartoon at Lantz, ‘The Legend of Rockabye Point‘ (1955). The married couple, ‘Maggie and Sam’, were reused in three more cartoons in 1956-1957. An interesting Lantz cartoon in their short lived Maggie and Sam series, due to accidental switched blood plasma, Sam takes on a ‘doggy’ personality whilst the dog becomes human, luckily, there’s no leg lifting.